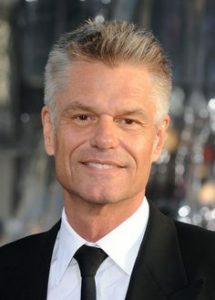 Actor Harry Hamlin is famous for his roles as Perseus in the cult classic film Clash of the Titans, and as Michael Kuzak in the television series L.A. Law. He was born as Harry Robinson Hamlin to Berniece, a socialite, and Chauncey Jerome Hamlin, Jr., an aeronautical engineer in October 30, 1951, in Pasadena, California, USA. He married Lisa Rinna in 1997. He was previously married to Nicollette Sheridan and Laura Johnson. Father: Chauncey Jerome Hamlin, Jr.
*He was chosen as People Magazine’s Sexiest Man Alive for 1987. *He was in a relationship Ursula Andress from 1979 to 1983. The couple had a son, Dimitri Hamlin, in 1980. *Wife Lisa Rinna he founded Belle Gray Inc. a women’s boutique located in Sherman Oaks, California in 2003.